In June 2018, the European Parliament received an unprecedented number of automated emails, with some MEPs reporting 40,000 emails crashing their inbox in a short space of time. The net effect was many were classified as spam given the content was “cookie cutter”, and the emails sending the messages could not be reached, or verified. 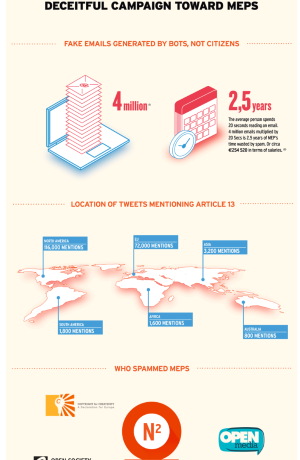 In the weeks that followed, an investigation has uncovered a warren of deceit and finance for the campaign of robo-calls, spam emails and auto-tweets against the Copyright directive that leads back to N-Squared, Google and cohorts with many saying these organisations were responsible for spamming MEPs – a hack on democracy. Suffice to say, MEPs were not impressed. The Guessing Game – How much is the DSM worth per year? DSM – Is the Commission making a GAF-A? Digital Splintered Market Zuckerberg Bingo – Print out and Play!